Baronnet and Stahler-Sholk examine Zapatista practices of constructing de facto autonomy. They highlight the pedagogical politics of a movement in which the community is a kind of school, with indigenous peasants developing “militant capital” through the experience of decision making by assembly, rotating tasks of education and health promotion, and building anticapitalist solidarity economies. Zapatista prefigurative politics extend beyond their immediate communities with outreach such as the “Other Campaign” and grassroots consultations coordinated with the National Indigenous Congress. 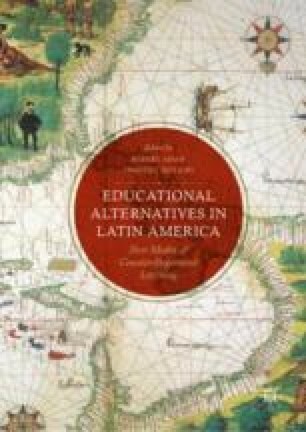 They also show how Zapatista autonomous schools embody a political pedagogy around the project of education for autonomy, based on decolonial validation of indigenous knowledge that challenges neoliberal multiculturalism. EZLN—Ejército Zapatista de Liberación Nacional. (2005, June). Sixth Declaration of the Lacandón Jungle. Chiapas, Mexico. http://enlacezapatista.ezln.org.mx/sdsl-en/. Consulted 14 September 2016. Subcommander Moisés. (2015, May 4). Political economy from the perspective of the communities I. Chiapas, Mexico. http://enlacezapatista.ezln.org.mx/2015/05/24/political-economy-from-the-perspective-of-the-communities-i-words-of-subcomandante-insurgente-moises-may-4-2015/. Consulted 21 September 16.